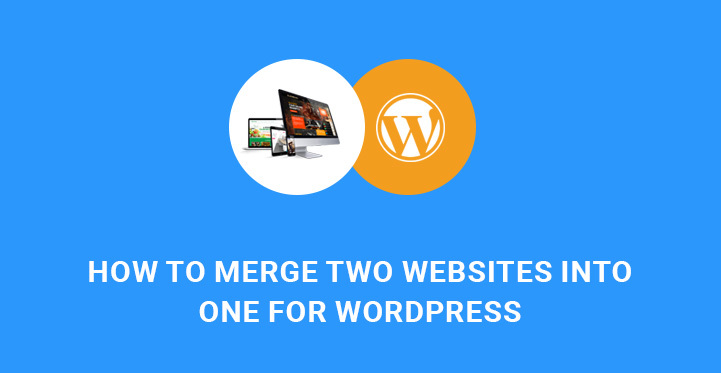 Home » wordpress » How to merge two websites into one for WordPress? How to merge two websites into one for WordPress? How to Merge two websites into one in WordPress is explained in this article which gives an idea on how to make two sites into one SEO friendly wise as well. In certain cases, having more than 1 website to represent individual or business interests is justified. Lots of companies and organizations are often engaged in multiple services and thus have few web attributes that fall within their business umbrella. It means that the subject matter of each of the websites is completely different and can make sense of its own. However, you may be satisfied with your website, but want to start a completely new one with the perspective of merging them together in the nearest future, so that the content of your old website will not be lost. Another case when people are inclined to merge their websites or blogs is when some of them is not doing well and needs additional support to yield results. In such case, mixing that one with a more productive website or blog can solve all the hassle. However, if we try to compare all pros and cons of having different websites, advantages of merging them will not fall behind the disadvantages of doing that in in quantitative terms. First of all, running more than 2 separate websites and keeping an eye on them all the time is time consuming. Naturally, keeping all the websites up to date both in terms of functionality and external look requires more time and efforts, as well as additional costs for their maintenance, development, marketing and more. Hence, if you own two WordPress websites or blogs and want to discover the possible ways to merge two WordPress websites into one, here is a simple tutorial to light up your way to success. Although you may achieve the successful merge of your websites, there are certain things to take care of in order not to lose your web traffic, ranking, SEO, information, etc. First of all, it’s worth mentioning, that consolidation of two different websites and using them united does not require the integration of additional tools, extension or plugins. By default, WordPress templates are equipped with all the necessary controls and features to organise everything properly. Now, let’s talk about one of the important things you should bear in mind before you start to merge two WordPress websites into one. Create and keep complete WordPress backup of your original website first, then go ahead with merging process. This is a compulsory safety measure to guarantee the possibility to revert if anything goes wrong. Now, let’s take a look at what we can do if we want to merge two WordPress websites into one with pretty little efforts and while taking into consideration all the important nuances. First and foremost, you need to go to your WP dashboard, Tools, Export and choose what you want to export. Choose to export All content and then press Download Export File. Now XML file will be prepared and sent to your browser. Save this file on your PC as you are going to use it soon. This XML file will contain all your WP website post and pages, custom post types, if there are any, categories and tags, custom taxonomies, if any. Once you are done with exporting the content from the first WordPress site, it’s time to merge it with the second one. In order to execute the transition of the first site content, go to the admin dashboard of the site where you want to have 2 WP websites merged, then Tools, Import Page. You will be provided with the list of the available import controls to run on your WordPress powered site. Choose the last option, which is Install Now, and the WordPress importer will be installed. After the installation is complete, click on Run Importer to run it. What is left to be done at this point is to export your XML file you have saved on your PC earlier. Choose that file and then click Upload file and import. After you have browsed and uploaded the relevant XML file, WordPress will start exporting and analyzing it, after which you will be transferred to the page, where you can control import settings. Here you can choose to assign the content imported by your first site to authors or create new authors. Now find Download and import file attachments box and enable it to import file attachments for your old WordPress based site. Click Submit and go on. Now the import process of the export file will start so that you can have your old or first website content merged with the new website. Once the process is finished, a success message will appear proving that “all done” and warning you to update passwords and roles of imported users. Congratulations! You have successfully managed to merge two WordPress websites into one. The next step is to configure the proper redirects so that the visitors of the website you have merged will be automatically redirected to your combined website. This process is responsible for sending both web viewers and visitors to the new website’s URL without forcing them to type the new website domain name. The redirection process is also essential in keeping the site’s rankings and authority in the digital arena and search engines. www. *****.com should be the name of your new WP website. Save changes you have done and upload that file back to the server. You can try to view one of the posts of your previous website and you will be immediately redirected to the same post located in the new website. Basically, we are done with covering the whole process you can use to merge two WordPress websites into one. Afterwards, you may need certain troubleshooting, fixing and edition processes to get everything accurate and well working. This entry was posted in wordpress on February 21, 2019 by SKT Themes.